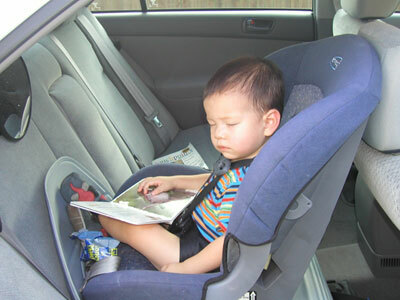 Kiran rear-facing at 2 years old in the Evenflo Titan. CPSafety NOTE: Please note that while this child does fit the criteria for the rear-facing album (rear-facing past 1 year and 20 lbs), the picture above does show some misuse. The chest clip on this seat is placed too high (the top of the chest clip should be even with the bottom of the armpits). We do not recommend the use of aftermarket products, such as "seat-savers" and the mirror that is shown in this picture.